How a visit to Wales and one young man’s glance into the future evolved into one of the world’s most outstanding Music Festivals. Nestling high in the mountains above the Plana de Vic lies the small Catalan village of Cantonigròs. With a population of some 200 people, this might seem a most unlikely genesis for a Music Festival which every year since its inception in 1983 has been attracting choirs and dance groups from all corners of the globe to participate, providing a feast of competitions and performances which bring in audiences not only from the immediate community but from far beyond. Many of the ideas derived from the Welsh model of the Eisteddfod were incorporated from the start. For example, as in Wales, the auditorium was a large marquee seating several thousand people and the tradition of community support through hospitality which had so impressed the young Busquets resulted in his asking many homes in Cantonigròs and the surrounding villages and towns to do the same. 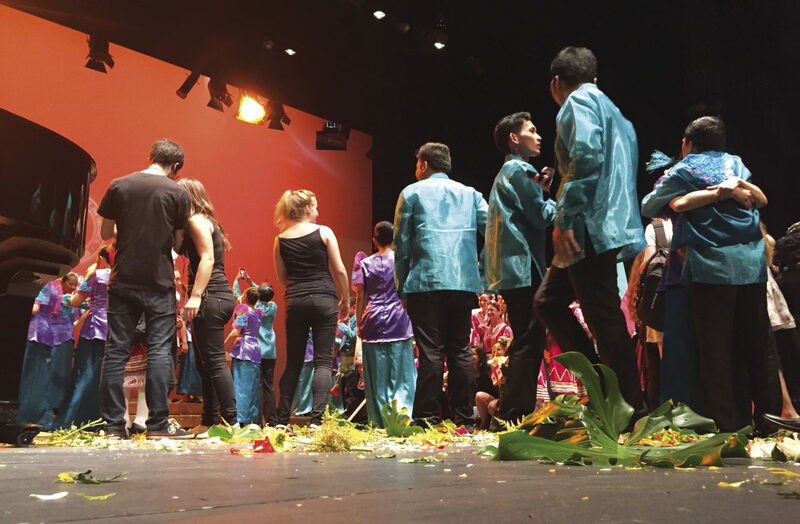 The result was that many people subsequently opened their doors to the visiting choirs and dance groups from all over the world. A large army of volunteers had to be recruited for other jobs and the response was huge; many of that original cohort remain with the Festival to this day. Without them the Festival simply would not operate and it is a telling fact that many give up work or holiday time both before and following those intensive four days of competition and performance activity in order to volunteer their services. 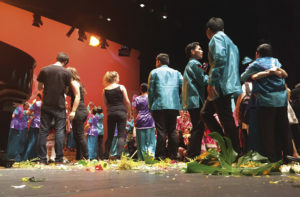 The tradition of inviting groups from far afield began in the Festival’s first year with the arrival of a group from the Philippines, a country which has continued to send groups every year. However, despite the parallels with Llangollen, other characteristics of Cantonigròs are very much its own. There is no question that at the core of the Festival’s success and survival is the Busquets family itself. 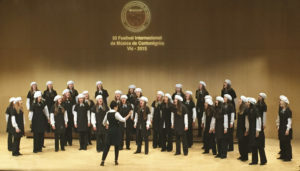 During the Festival, the eight children of Josep María Busquets and his wife Rosa María all hold key positions within the organisation and running of the four intensive days in mid-July each year when the Festival takes place. They are also often on hand to help during the rest of the year when the next Festival is being prepared. This tradition of family participation has in turn been extended to the children and grandchildren of the original families and of visiting families such as ourselves. My wife has been a volunteer from the Festival’s early days and together we have seen our two young daughters and their friends profit greatly from the work they do in organising and co-ordinating the proceedings backstage. Other young people working as guides and interpreters find that they may need to communicate in another language or in a mixture of languages at times. Through this, they gain an understanding of different customs, and, as happens so easily with the young, soon discover much of what they have in common and, not unusually, form long-standing friendships. One of the most humbling aspects of the Festival is to see groups arrive, who having spent three or four days travelling across Europe in a cramped coach without air conditioning, then go on to give outstanding performances, sometimes more than once on the same day. Some may battle with various maladies at times but nevertheless remain determined to take part if at all possible and do honour to their group, family and country. In order to have facilities that would match the level of the groups that the Festival was attracting, a move to the Atlàntida theatre complex in nearby Vic was announced for the Festival’s 30th Year in 2012 and its name was formally changed to Festival Internacional de Música de Cantonigròs a Vic. This naturally led to questions as to whether a Festival founded amongst the rural surroundings of Cantonigròs could maintain its legacy within these new surroundings. Equipped with two excellent auditoriums, with a concert series featuring some of the world’s top performers as well as popular local artists and home to a Music School, this prestigious venue was indeed a major change of profile for the Festival. The warm welcome given to the Festival from the Ajuntament (City Council) of Vic, the Atlàntida and the people of Vic itself was quite overwhelming and the Festival has now become an important event in the town’s year. Meanwhile, the personality of the Festival with its established working structures of families and volunteers well in place, has continued to go from strength to strength. 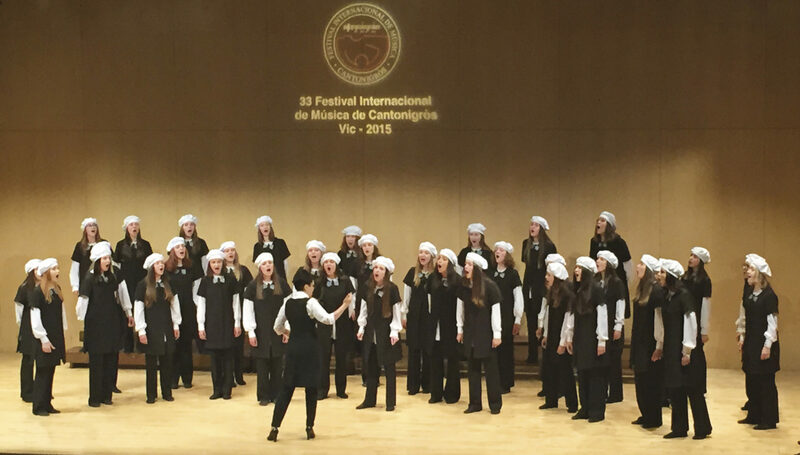 This year’s Festival, which ran from 16th-19th, July saw a wonderful range of choirs and dance groups visiting Vic. 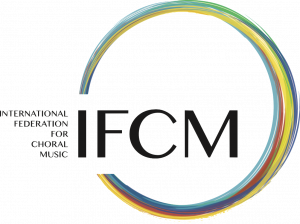 The prizes for the five competitions were generously donated by the Generalitat (Government) de Catalunya, Ajuntament de Vic, Institutió Puig Porret and the Ajuntament de Manlleu and the Festival itself. 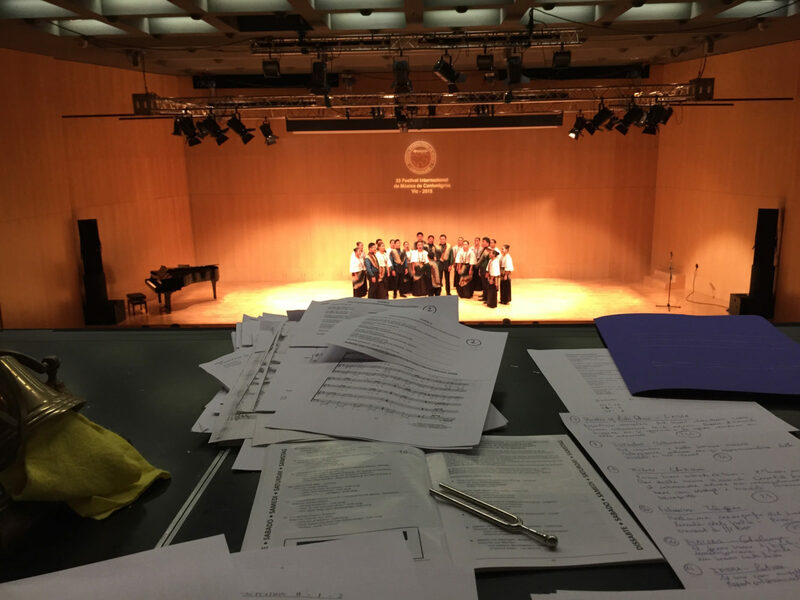 There was a high level of performance in all the competitions and the evening concerts. The Inaugural Concert featured the Catalan Youth Orchestra and soprano Ulrike Haller as the Festival’s opening event. The First Prize for the Mixed Choirs was won by the Palawan State University Singers from Puerto Princesa, Philippines. 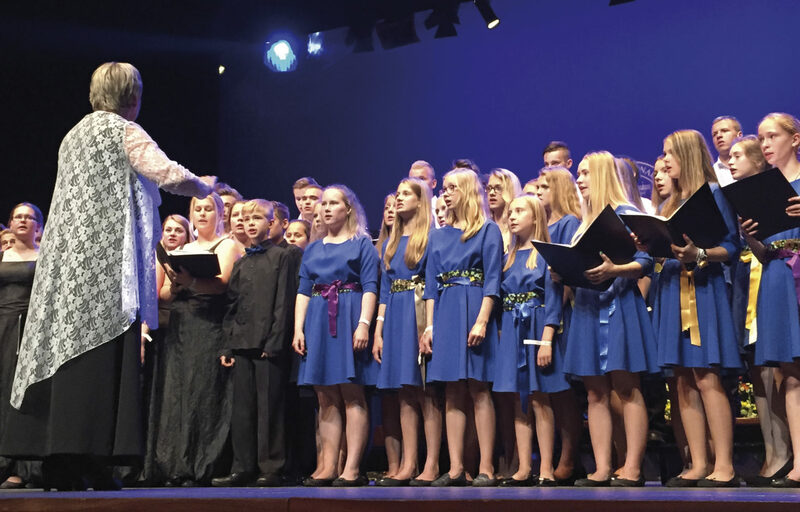 Three First Prizes were won by The Children’s Jazz State Choir from Ekaterinburg, Russia, who as winners of the competitions for Folksong for Mixed Choirs, Female Choirs and Children’s Choirs, became one of the Festival’s highlights. This choir sang with such a unanimity of style and character and at such a high technical level that any one of their performances could have been issued as a live recording. The Dance competition was won by the remarkable Catalan dance group, Esbart San Martí who, with music of the Cobla, (a largely double reed folkloric Catalan ensemble plus a single double bass) performing a contemporary score of intermittently disturbing power, gave a dynamic and moving performance which arguably made history in giving new life to a long-established Catalan art form. It is perhaps this performance which for me sums up the spirit of this remarkable Festival. Never content to remain comfortable with its format and ideals, it refuses to stand still and has a heart which is truly palpable for those present. Visiting Wales for the first time and having that glance into the future, could the young Busquets have had even the remotest idea of what might someday transpire? What can be said is that all those fortunate enough to be part of the Cantonigròs Festival find themselves drawn into an experience which lives on long after the final rousing Festival Hymn, sung by all. The future of this highly individual Festival seems assured: it has indeed opened that “dialogue” of peace, knowledge and understanding between people, as its founders hoped it might.